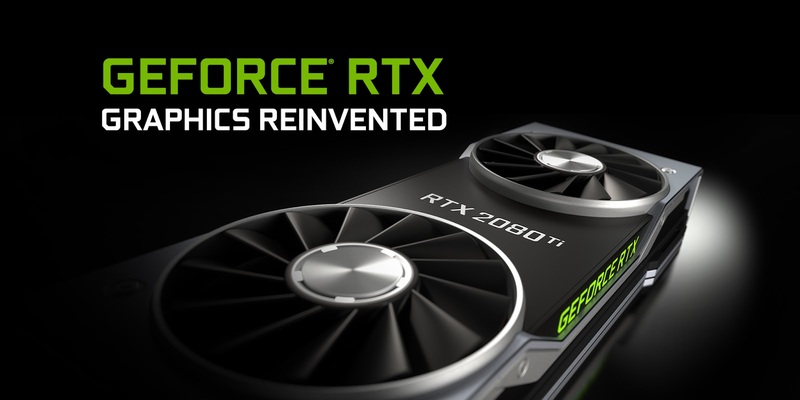 NVidia's newest high performing graphics cards are now available and Psychsoftpc is now shipping their high performance gaming computer line with NVidia RTX 2080 Ti, RTX 2080 & 2070 GPUs . The latest in a long line of cutting edge graphics cards, the RTX 20xx cards are powered by the Turing GPU architecture and the all-new RTX platform. This gives folks up to 6X the performance of previous-generation graphics cards and brings the power of real-time ray tracing and AI to games. The revolutionary NVIDIA Turing architecture combined with the all new RTX platform fuses together real-time ray tracing, artificial intelligence and programmable shading to give a whole new way to experience games. Ray tracing is the definitive solution for lifelike lighting, reflections and shadows, offering a level of realism far beyond what’s possible using traditional rendering techniques. Turing is the first GPU capable of real-time ray tracing. Ray tracing is the standard for applications such as visual effects in the film industry, but it is extremely computation intensive, so it has been impractical for gaming, until now. Artificial Intelligence is driving the greatest technology advancement in history and Turing is bringing it to computer graphics. Armed with Tensor Cores that deliver AI computing horsepower, Turing GPUs can run powerful AI algorithms in real time to create crisp, clear, lifelike images and special effects that were never before possible. Programmable shaders defined modern graphics. Turing GPUs feature new advanced shading technologies that are more powerful, flexible and efficient than ever before. Combined with GDDR6, the world’s fastest memory, this performance lets gamers tear through games with maxed-out settings and incredibly high frame rates. Ray tracing is the holy grail of gaming graphics, simulating the physical behavior of light to bring real-time, cinematic-quality rendering to even the most visually intense games like never before. Ray tracing calculates the color of pixels by tracing the path that light would take if it were to travel from the eye of the viewer through the virtual 3D scene. As it traverses the scene, the light may reflect from one object to another, be blocked by objects, or pass through transparent or semi-transparent objects. All of these interactions are combined to produce the final color of a pixel that then displayed on the screen. When it comes to next-gen gaming, it's all about realism. GeForce RTX is light years ahead of other cards, delivering truly unique real-time ray-tracing technologies for cutting edge, hyper-realistic graphics. By combining advanced VR rendering, real-time ray tracing, and AI, the GeForce RTX takes VR to a new level of realism. The RTX Platform also has a new deep learning powered technology stack bringing AI-based features that accelerate and enhance graphics, photos imaging and video processing directly into applications. NVIDIA NGX features utilize Tensor Cores to maximize the efficiency of their operation, and require an RTX-capable GPU. NGX makes it easy for developers to integrate AI features into their application with pre-trained networks. Powered by Turing’s Tensor Cores, which perform lightning-fast deep neural network processing, GeForce RTX GPUs also support Deep Learning Super-Sampling, a technology that applies deep learning and AI to rendering techniques, resulting in crisp, smooth edges on rendered objects in games. Of course, such a high powered GPU needs an equally powerful gaming computer to contain it, a machine that's more than a match for all that technology. Psychsoftpc Psyborg Extreme Gaming PCs are the answer. Made with the latest Intel Core CPUs, including the amazingly fast Core X Series, these machines can keep up with the RTX GPUs and offer extreme performance not just for gaming but photo editing, virtual reality, video creation and live streaming. Because while the cards and machines say they are for gaming (and they are great for that), these machines and GPUs can do so much more. So if folks want a computer for graphic design or digital photography or editing that video they shot on their GoPro or 3d rendering these are the computers for that too. And with Tensor Cores, these machines are great for AI applications and Machine Learning Algorithms. So don't think of these as just gaming machines. The possibilities for them are many. Psychsoftpc is an artisanal computer company based in Quincy, MA, so they hand craft all of their machines and subscribe to a Just In Time philosophy. They are constantly evolving their machines with the very latest technology and are often the first to put out machines that take advantage of the latest tech because they don't stock parts or pre-build machines which have to moved before they can use the most advanced technology in their machines. So while the other guys can take months to put out machines with the latest, fastest tech, the folks @Psychsoftpc can take days. Thomas Friedman in his book Thank You For Being Late says we must constantly adapt to rapid shifts in technology because of accelerating technological change, specifically the impact of Moore's Law and market forces which are linking the world more powerfully than ever before. Unlike the other guys out there, Psychsoftpc embraces this. They are constantly adapting and improving their machines. They don't release new model names, just improve the machines they build with the latest tech as it comes out. Psychsoftpc was among the first companies to offer Linux as a preinstalled option on its machines, the first to offer turn key entry level Linux Cluster Supercomputers affordable for small businesses, the first to offer a Digital Signage controller PC, one of a select few recognized by NVidia and Autocad for quality and capability in High Performance Professional Workstation design and manufacture, the first and only company to offer a Point of Sale Print Signage solution (currently in use in many major US retail chains), one of the first five companies to make authorized Tesla Personal Supercomputers, the first to offer Tesla Personal Supercomputers with Linux, the first and one of only two companies to produce turn key Hadoop Clusters for Big Data Analysis and the first to make Virtual Reality Ready Gaming Computers all while maintaining complete manufacturing in the USA.